The 2018 Population and Migration Estimates released by the Central Statistics Office show that the number of immigrants has increased by 6.7 per cent year-on-year, from 84,600 in 2017 to 90,300 in 2018. The number of emigrants decreased by (-13.1 per cent) from 64,800 to 56,300 in the year to April 2018. These combined changes have resulted in the highest net inward migration (+34,000) since 2008. Of the 90,300 people who migrated to Ireland in the year to April 2018, some 28,400 (31.5 per cent) were estimated to be Irish nationals. 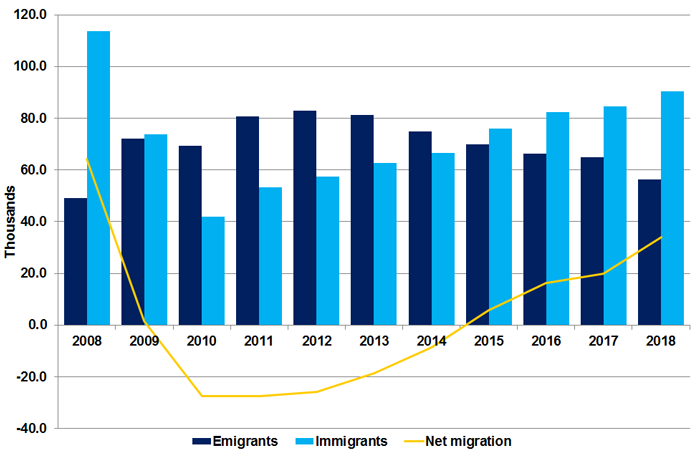 Irish nationals experienced net inward migration for the first time since 2009, rising to +100 in 2018 from -3,400 in 2017. 593,600 non-Irish nationals were resident in Ireland in April 2018, accounting for 12.2 percent of the overall population. 20,100 migrants arrived to live in in Ireland from the UK while 11,400 emigrants left Ireland to live in the UK. Non EU-nationals continued to display strong migration flows, accounting for 30,900 (34.2 per cent) of total immigrants and 10,000 (17.8 per cent) of total emigrants. This resulted in estimated net inward migration among non-EU nationals of 20,900. 49,200 (61.7%) of immigrants aged 15 or over had a third-level qualification. Irish nationals remained the largest constituent group among emigrants, accounting for 28,300 (50.3 per cent) of the 56,300 people who emigrated. This represents a decrease of 2,500 (-8.1 per cent) on the year to April 2017 when 30,800 Irish nationals emigrated. The number of births in the period April 2017 - April 2018 was 61,200, while 30,700 people died, resulting in a natural population increase of 30,500. The combined effect of natural increase and positive net migration resulted in an overall increase in the population of 64,500 bringing the population estimate to 4.86 million in April 2018.